After using my surf pi 1.2 which I built from a kit for a while, I decided that I needed a a coil housing which was more durable and less bulky than using the two plastic plates which I originally used. After searching for a bit I found someone who actually makes his own coil shells out of thermoformed plastic. His website is sort of janky (but still very functional! ), and it wasn’t a site that was easily found, but I decided to give him a try as his products looked pretty sweet. He also sent me a document which detailed using graphite blaster spray to shield the coils. You can check it out here: Building Concentric Coplaner coils (scroll down page 12 for the shielding info). Anyways, on to the build. I received the clam shell style coil shell housings with PG7 cable gland reliefs. Just a quick test to see how the original coil fit. Perfect! Don mentioned that I could epoxy the empty voids or fill it with scrap material. I chose to fill the voids with epoxy as it would allow for a pretty good watertight seal. He warned however that when using epoxy one needed to be careful of the heat it gives off when curing, as it could potentially melt the plastic! 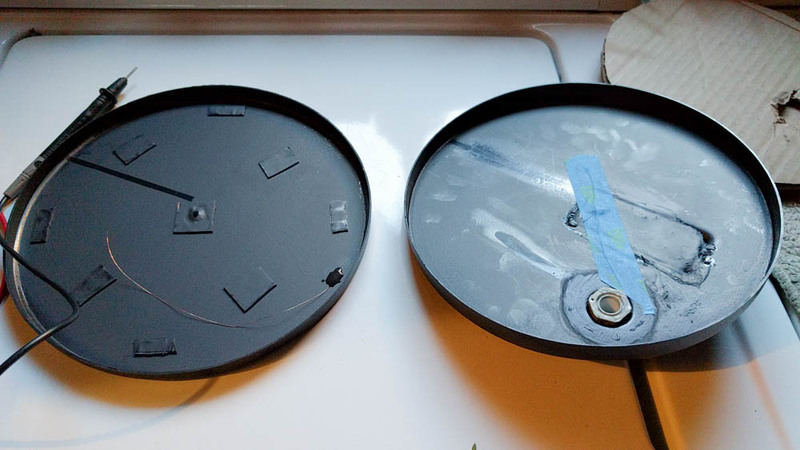 Being one to go for cheap and not buy slow curing stuff, I just purchased some epoxy at home depot and decided to figure out the heat problem later. Go to Home depot and buy all this stuff at once. Dont go to Lowes or you’ll end up making a trip to home depot to buy the graphite spray like I had to. If you notice in my picture I purchased some contact cement. In the document from Don about shielding I linked to above, he had luck with mixing graphite and contact cement to make a conductive glue. I wasn’t so lucky and couldn’t get it to work as I just thought I could spray some of the graphite dry spray into the cement. It was messy and didn’t work at all, I ended up buying some wire glue instead which worked a treat! 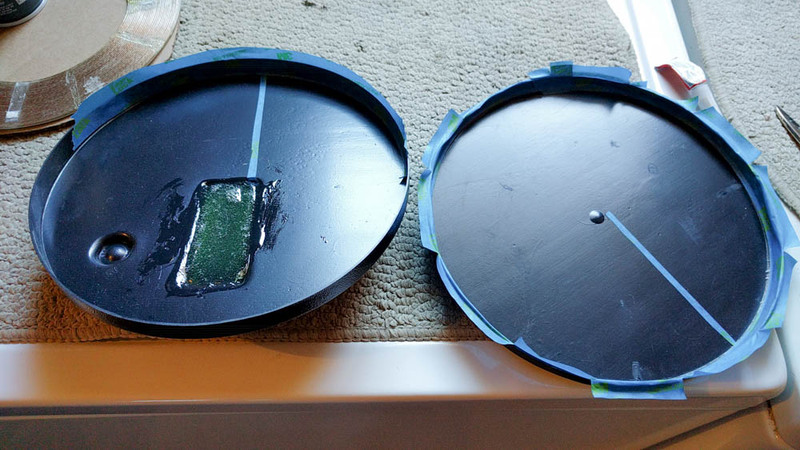 Its now time to epoxy the voids and strengthen the area where the metal detectors lower shaft will connect to the coil housing. Its important to get this right and MIX THOROUGHLY. When I mention mixing thoroughly that means mix and mix and mix and get every little area of epoxy mixed. That means even the part that sort of sloughs off to the sides when you mix the middle area. If you do not (like I learned with my first coil shell try), you’ll get epoxy which doesn’t fully cure on the areas touching the plastic. Everything else in the middle will cure, but not the part that adheres the epoxy to the walls of the plastic. If you’re afraid of getting the epoxy everywhere, you can mask off the areas with painters tape that you don’t want the epoxy to get on. 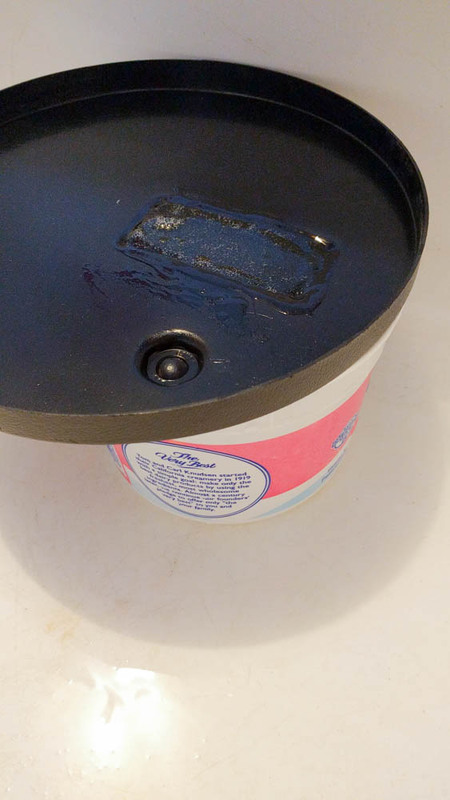 This will allow you to mix the thinned out epoxy that spread off to the edges. 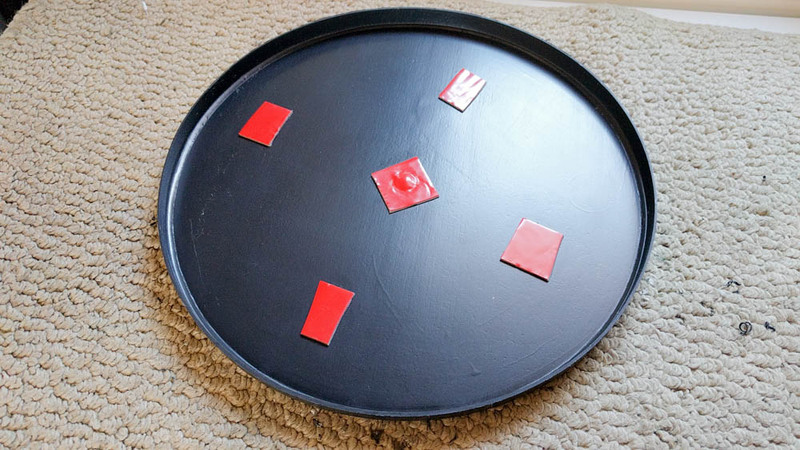 Mix and fill the voids with epoxy. If you don’t you’ll be sorryyyyy! And remember, MIX THOROUGHLY, don’t say I didn’t warn you either. See the wet looking edges of epoxy in the metal detector coil shell housing above? That part didn’t fully cure correctly because I didn’t mix it thoroughly for fear of getting it all ugly. 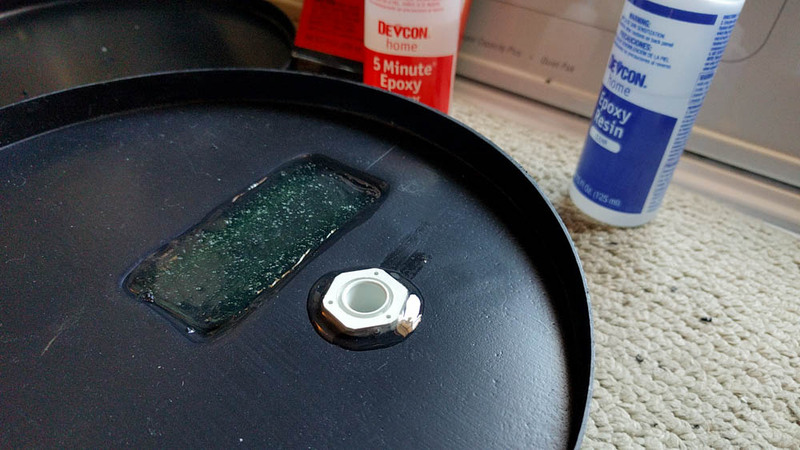 Wait for it to cure – my epoxy said 1 hour. *if you notice I have pictures with and without the cable gland installed. This is because I did this 2x and so the pictures were taken after I figured out the best streamlined process for building these shells. Do the cable gland dance! On my metal detector, I used RG6 coax cable for connecting the metal detector circuitry to the coil. Because of this, I found that the PG7 cable gland which was supplied was too small for the coax cable. I needed to use my PG9 cable gland reliefs which meant drilling out the PG7 indentation on the upper coil housing larger than it was intended (as he used a PG7 size connector to form the coil housing). I realized it needed more strength for support, and filled the void with epoxy as well. I recommend epoxying the main shaft ears first, then once that cures, epoxy the cable gland area so you can level the housing to get the epoxy to cure level. My PG9 on the left, supplied PG7 on the right. While waiting for the epoxy to cure, I moved on to prepping the tape which will hold the coil stationary. I had some gorilla double sided tape laying around and used that on the lower portion of the clam-shell housing. I left the backing on so I could spray the graphite directly on top of it, and just peel it off later. Go do something else now, since you need to wait for the epoxy to fully cure. Now that the epoxy is all cured, let’s drill a hole for the straight shaft bolt. The ear lobes for the lower shaft are sized for tesoro lower rods. Grab your lower rod and move it around in between the lobes. Eyeball it and you’ll see where the limits of movement are and what spacing you’ll need for smooth unhindered rotation. Mark that measurement on the outside of the lobe and then place the shaft on the outside (not inside the two lobes, but just against the outside of one of them). Grab your 1/4″ drill bit, insert it into the lower shaft hole, and rotate it by hand up against the outside facing lobe to make a pilot hole mark. This will be where you should drill your pilot hole. Drill a pilot hole with a smaller diameter drill bit and then use the 1/4″ to go all the way through both lobes. Go slow. Tired of tight holes? Let’s lube up! First, take the bottom half of the clamshell and mask the inside-facing, outer edge. 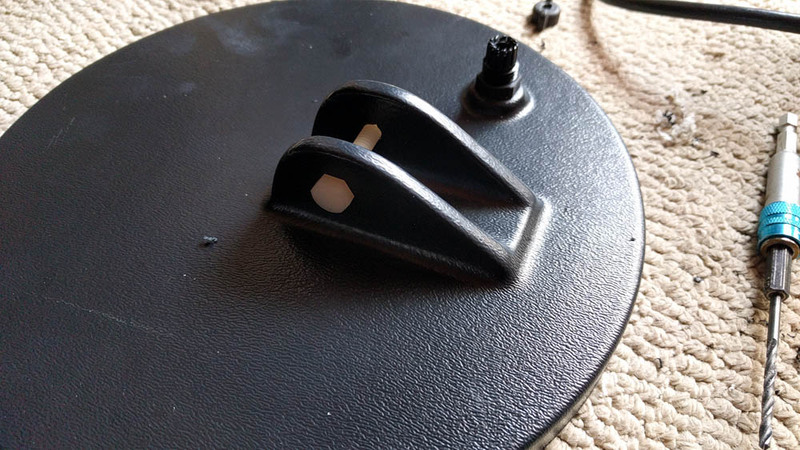 This part musn’t have any of the graphite spray on it as the RTV sealant will be applied to this edge which will adhere to the exterior edge of the top half of the coil housing when put together. This was taken from my first attempt at building the coil housing. You don’t need to mask the top inside edge like I did. In Dons document about shielding he masked off a line down the radius of the housing in order to stop eddy currents in the shield. I just did it anyway even though he found no difference with it and without it on his designs…he also said it was best practice. Now, apply the spray lightly and cover everything evenly. A little goes a long way with this stuff. Wear gloves and hold far away from your clothing. It will discolor them! After the graphite spray has dried, its time to break out the wire glue and glue a fine strand of wire to both halves of the coil housings. I took some speaker wire, and stripped off the insulation. This provided me with stranded wire which was very thin. I just needed two strands (actually it took 4 after realizing my contact cement graphite spray trick didn’t work). Its a good idea to do a dry fit now and see where the best location of gluing the wire to the housing will be as you’ll need the wire to run towards the cable gland opening (for both halves) in order to attach it to the cable coming from the metal detector (in my case the RG6 shielding). Just apply a small dab of wire glue and stick the wire in. Let dry and test if you get an Ohm reading with a multi-meter by touching a lead to the wire and one to any part of the graphite sprayed housing. If you get an Ohm reading you’re good to go! Just tape the wires down with some painters tape or whatever tape you have lying around (but be sure to have the grounding wires route to where the coil leads will be). When waiting for the wire glue to dry, I hot-glued cardboard to the top and bottom of the coil in order to strengthen and increase rigidity of the coil to be used within the coil housing. You want the coil to be as rigid and stiff as possible or risk movement within the coil housing causing false positives. 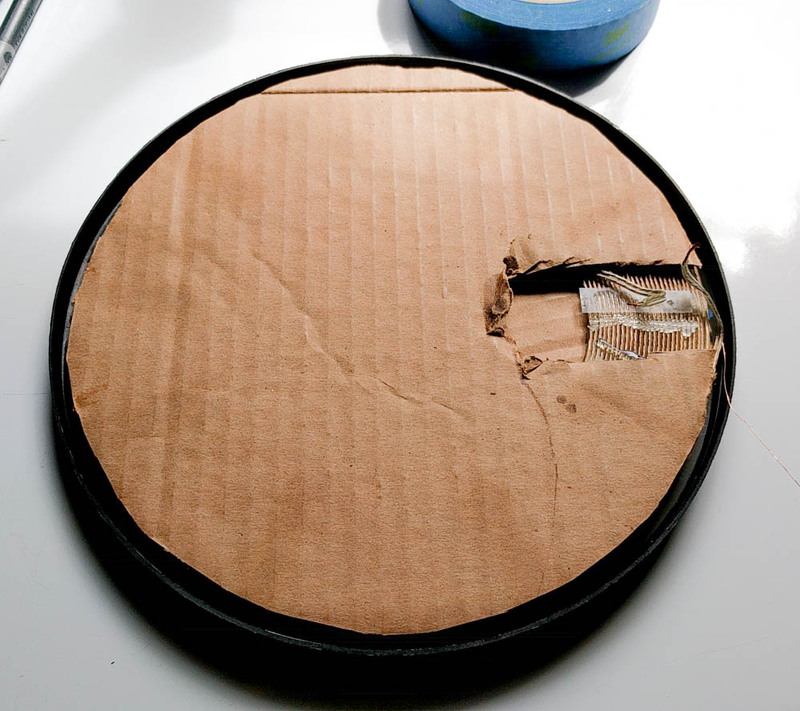 Don’t forget to make the cardboard look like Pacman so it will provide some room for the cable gland bottom and cable coming from the metal detector, it will also help you to fit and attach the coil shell shielding ground wire. Cut a section out of the top cardboard piece in order to accommodate the cable gland and cable coming into the housing from the metal detector. Its now time to remove the double sided tape backing and stick the coil onto the bottom half of the coil housing. Be mindful of where your run of grounding wire is to have it come as close to the coil leads as possible. It will aid in soldering them together. 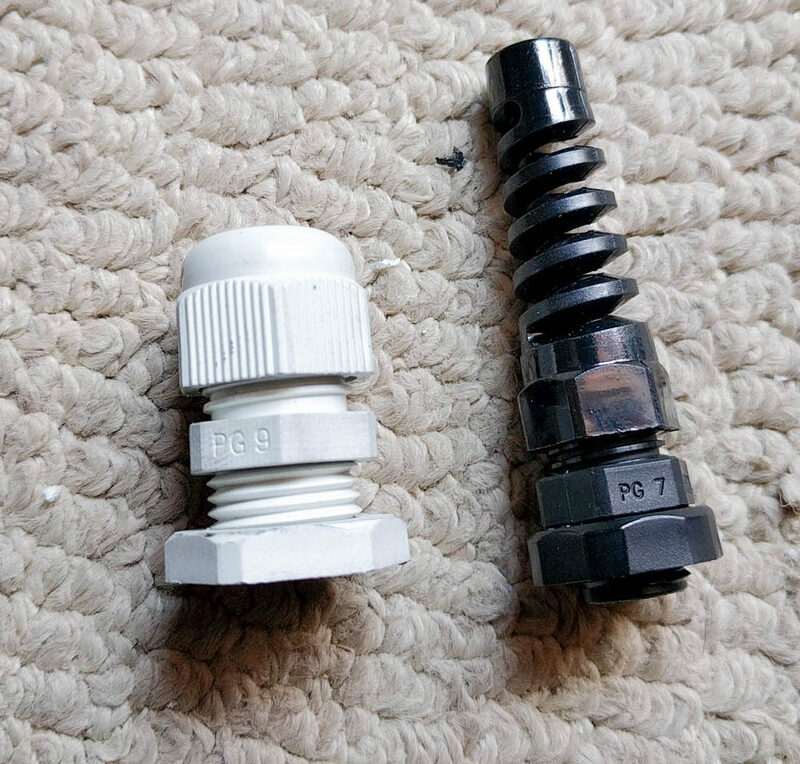 I don’t have pictures of this portion, but its time to run the cable gland parts up into the cable (cap first, then rubber grommet thing second), then insert the cable into and through the cable gland and down through the top coil housing half. To connect the coil to the detector, connect the inside leads of the coil to the “+”, and the outside leads of the coil wire to the “-” on the circuit board. Don’t worry if one of the wires overlaps the face of the coil. Solder the shielding ground wires to the “-” wire (in my case it was the RG6 shielding). Carefully push the two clam shell halves together and tape them closed. Go for a test at the beach with your metal detector (away from electrical interference) and make sure everything works as intended. 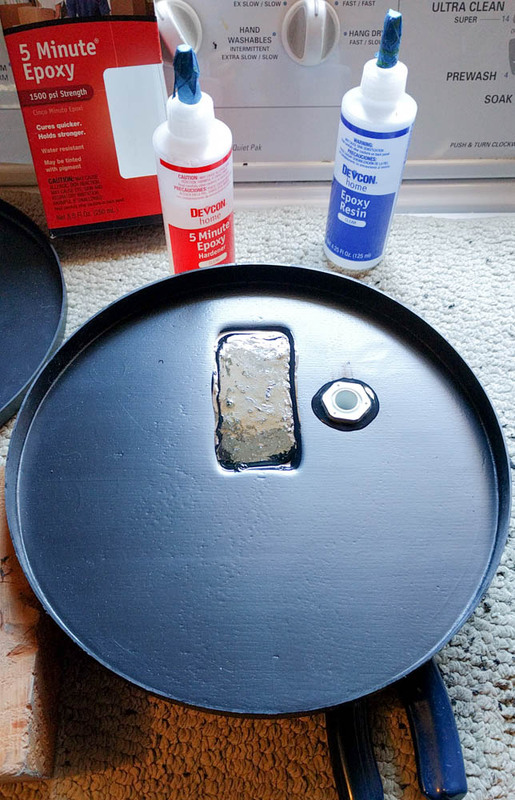 If it does, just clean and carefully separate the two halves and apply the RTV to the bottom half inside facing outer edge, then push the top half into the bottom half. Let dry and you’re done. That’s it! You now have a solid coil housing for your metal detector. Happy Hunting! This entry was posted in Hack and tagged clam shell coil housing, clamshell coil housing, coil housing, coil shell, DIY coil shell housing, metal detector clam shell style coil housing, metal detector coil housing on July 18, 2016 by Blog Master. Hello regards, interesting the issue of the construction of a coil for metal detectors, I want you to please comment on the type of wire used in this example and where it is obtained.